You all know about my obsession with citrus - lemons, oranges and limes, to be exact. However, not sure that you have noted my love of nuts of all types. I don’t necessarily eat them all – my particular favorites are cashews and macadamias, although I love hazelnut gelato when in Italy – but guests to my home will always find a dish of my own blend, heavy on the cashews and macadamias. Between guests I am always dipping my fingers into the mix and pulling out those in particular, so I keep extras sealed for when guests are expected. Walnuts are in the Flourless Chocolate Cake and pistachios are found in crostatas (Italian tarts) and in my Sundried Tomato and Pistachio Pesto recipe. Pistachios became a favorite in my household as someone doesn’t like almonds. Then we have the other issue of a necessity to find another gluten-free dessert recipe, especially for those who are not chocoholics, and those who shouldn’t, like myself, eat gluten but want something sweet. Then there is the joy of creating something that you like and when you finally get it right everyone, even the skeptics love it, well… like it. Another reason is as a child growing up in Jamaica, and this totally dates me, nuts were a luxury item as they were imported. I still remember going back home, after our move to New York, and carrying containers filled with cashews and mixed nuts as presents to the family because my grandfather and uncle loved them. So, nuts are special as they bring back childhood memories and the thought of loved ones. Like chocolate, nuts are the ultimate gift. It is a sad day when there are no nuts in my cupboards. 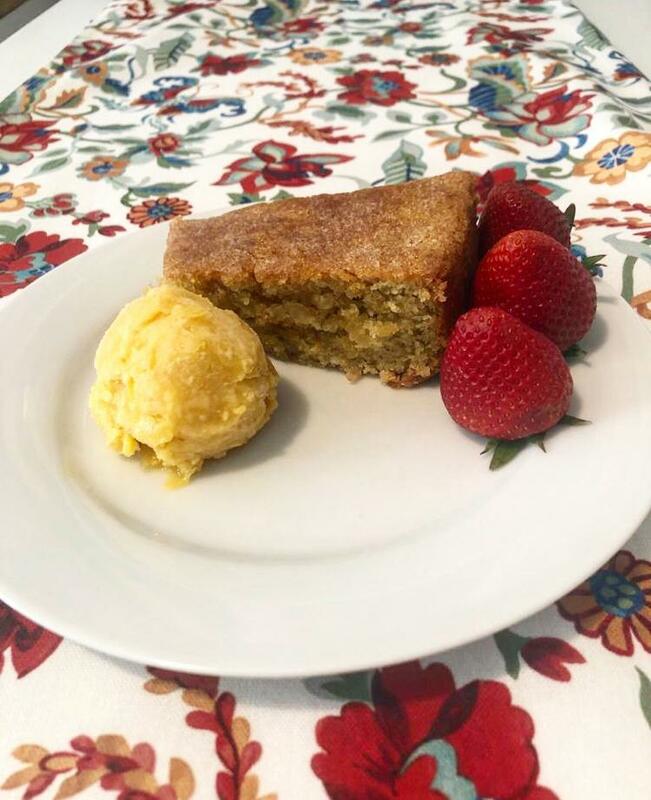 Do let me know about the Almond Lemon Cake recipe that I worked on as it seemed to be a recipe in the air, and I thought – gluten free. It didn’t really work until I decided to separate the eggs. Then it just worked beautifully. I love that I can change up the flavor going from a plain almond cake to a more tropical cake adding banana or coconut flakes and coconut milk. Enjoy and I look forward to hearing from you. Preheat oven to 350 F. Cream the butter and sugar together for approximately 10 minutes. In the meantime, add the egg yolks one at a time to the butter mixture. Mix together the almond flour with all of the other dry ingredients. Gradually add the flour mixture to the first mixture and add the lemon juice and lemon zest. Whip the egg whites and fold into the batter, making sure that it is fully incorporated. I usually do this last bit using a spatula. Pour into a baking pan prepared with butter and gluten free breadcrumbs (or cut parchment paper to size and add to the bottom of the pan), or a non-stick cooking spray. Bake, testing for doneness after the specified time. If done, remove from pan immediately. Bathe the cake with the hot lemon syrup to bathe as soon as it leaves the oven on all sides. Cook at low heat, stirring frequently until the sugar dissolves. Cook for another 5 minutes until the syrup thickens. Pour immediately approximately ¼ of the syrup over the top of hot cake before placing in a cake plate, leaving more or less ¾ of the syrup to moisten the cake on all sides. - For a coconut cake substitute the ¼ cup of lemon juice with ½ cup of coconut milk and add 4 oz of unsweetened shredded coconut. - Another variation is to substitute ½ cup of lemon juice with orange juice. To make a more sophisticated cake slice an orange in thin rounds that are then dropped into the orange syrup (substitute orange for lemon) and bring to a boil. Remove the orange slices and cover both sides with sugar. Then they are placed at the bottom of the prepared pan prior to pouring in the mix, for an orange upside down cake.